Hello! And welcome to the Bedbug Bible Gang Jumbled Journeys! 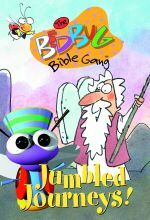 The bedbugs are setting out on a trio of mixed up adventures in the desert. The stories of The Ten Commandments, Wilderness Wandering, and Jesus' Temptation are told through rhyme and song. So lace up those sandals because this Jumbled Journey is about to begin. This delightful program combines 3-D computer animation with illustrations and live-action puppets. Recommended for ages 3-8.